Mega Sale! Save 27% on the T-Sac Tea Filter Bags, Disposable Tea Infuser, Number 4-Size, 6 to 12-Cup Capacity, Set of 400 by T-Sac at Mystic Oaks. MPN: BHBUKPPAZINH2356. Hurry! Limited time offer. Offer valid only while supplies last. T-Sac's tea filter bags are single-use, natural paper tea infusers for steeping to brew high-quality loose leaf tea with the convenience of tea bags. T-Sac's tea filter bags are single-use, natural paper tea infusers for steeping to brew high-quality loose leaf tea with the convenience of tea bags. Enjoy the fresh, natural taste of loose leaf tea without the hassle and mess of conventional straining methods. Control the amount of tea used for a more robust and flavorful cup of tea. Easily blend teas for customized brews. T-Sac tea filter bags are made with fine paper fibers that allow tea to brew quickly while keeping sediment and smaller tea leaves of the finer grade teas from escaping into the brew. The top flap folds over to secure contents inside. The expandable, gusseted bottom allows ample room for tea leaves to fully expand and t-sac to sit securely without the need for a filter stand. Easy to use. Simply open the t-sac, measure in the desired amount of loose leaf tea and fold the top flap over. Place into a teacup for mug and pour in just-boiled water. Steep tea no less than 3 minutes to release its essential oils and maximum the brewed infusion with aroma and flavor. Once tea is steeped to desired strength, discard the t-sac. Great for steeping all types of tea, including black tea, oolong tea, green tea, chai, chamomile and other herbal tea. Or use for mulling spices for cooking and baking, or make hot apple cider, spiced wine, and other drink recipes with mulled spices. Just fill with aromatic spices instead of loose tea. 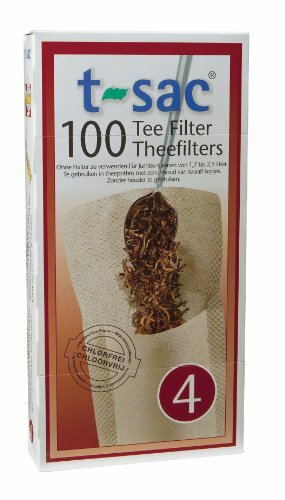 T-Sac tea filter bags are user friendly and disposable for convenience and easy cleanup. Made in Germany from all-natural, unbleached paper with no chemicals or artificial ingredients to taint the flavor of the tea. Environmentally sensitive, completely biodegradable and fully compostable. Available in 4 convenient sizes to brew tea, from single servings to large teapots.